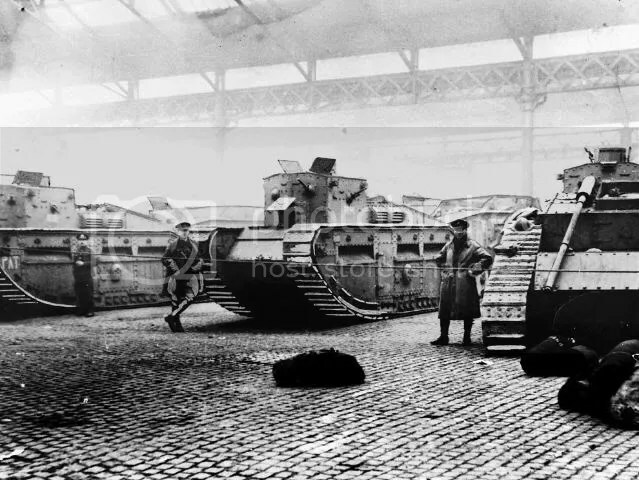 1919 – Westminster Removed Their Weapons and Locked-Down Scottish Soldiers in Their Barracks – Then Illegally Deployed An English Battle Group and Declared Martial Law Against the Scottish Public. What Will a No Deal Brexit Bring? Before and during the First World War, there was no statutory standard working week in the UK although it was generally accepted that the norm was 54 hours. In the course of the war the coalition government attempted to impose upon workers, ” the Munitions Act,” “the Dilution of Labour Act” and the “Defence of the Realm Act,” all giving government draconian powers to negate long-fought-for pay rates and conditions for skilled work, and to crack down on opposition. The measures were resisted strongly by the Clyde Workers’ Committee (CWC) in Glasgow. At the war end the armed forces were demobilized and returned home to the labour market. The infusion of the large body of new workers seeking work in an rapidly shrinking economy base resulted in a steep rise in the unemployed and resultant hardship and discontent. In the absence of any initiative from the government in Westminster a number of Trades Unions in Glasgow addressed the issue and brought forward proposals which if accepted by the government and employers would reduce the working week to 40 hours expanding the labour market and reducing unemployment. After weeks of negotiations a provisional agreement was achieved, between government, employers and some Union officials, providing for the introduction of a 47 hour week, (applicable to shipbuilding and engineering trades only) at some time in 1919. Shop Stewards of the (CWC) in Glasgow rejected the offer and tabled a counter bid supported by limiting the standard working week to 40 hours with paid tea-breaks (removed under the 47 hour week offer) restored. A strike meeting (over 3,000 attended) was held at the St Andrews Halls on Monday 27 January 1919. Immediately after the meeting 40,000 workers downed tools, answering the call to strike. By Friday 31 January 1919 the number of workers on strike had risen to 60,000 plus. United action by workers, (on this scale) had not been seen in Scotland since the Weavers of Glasgow’s Calton District had engaged their employers in a long and bitter dispute over wages and basic justice in 1787, which ended with the murder of a number of weavers by government forces. A later insurrection in 1820 again ended in the death of protestors and deportation to the colonies of activists and their families. 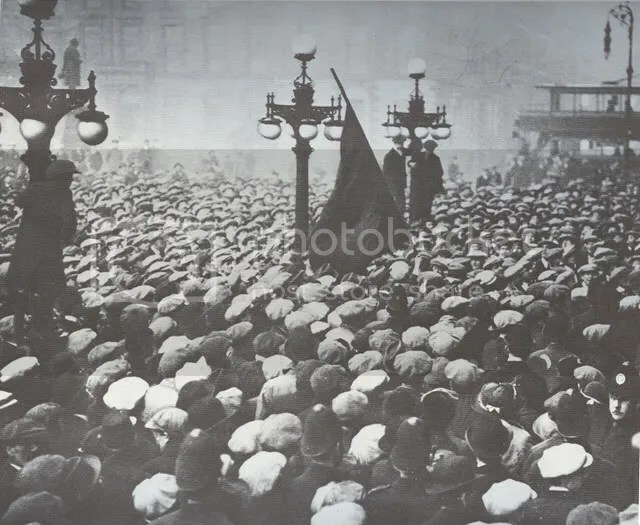 On Friday 31 January the strikers were invited to a meeting in George Square at which it was intended that the Lord Provost Sir James Watson Stewart would issue the official response from the Westminster government to the unions’ request for government intervention in the dispute. A large crowd of strikers (marshalled by a large police force) gathered in George Square to witness the statement. But faced with a noisy crowd the Lord Provost instead invited representatives of the CWC (led by David Kirkwood) and the Glasgow Trades Council (represented by Emanual Shinwell) into the Glasgow City Chambers for a briefing. Not long after the start of the briefing the Lord Provost was alerted to trouble outside the City Chambers and asked Kirkwood and Shinwell to intervene and establish order. They agreed, left the meeting and ventured outside, to be immediately ambushed by a group of police who knocked Kirkwood to the ground and arrested the delegation on a charge of “instigating and inciting large crowds of persons to form part of a riotous mob. What sparked the riot has never been formally established but many witnesses (independent of the incident) blamed the actions of mounted police, who it is alleged (acting on secret government orders) launched a baton wielding charge on the crowd without provocation. What is fact is the impact of the confrontation between the protestors and the police. The crowds attempts to get away from George Square were thwarted by “night stick” wielding police who had deployed forces at each of the potential escape routes effectively “Kettling” the protestors. This resulted in pitched battles between armed police and unarmed demonstrators. The folly of precipitating the confrontation dawned (to late) on the police as a riot then ensued, over which they had no control. Iron Railings, cobble stones and bottles were used in defence against the police truncheons and dispersing the crowd proved to be beyond the police presence. 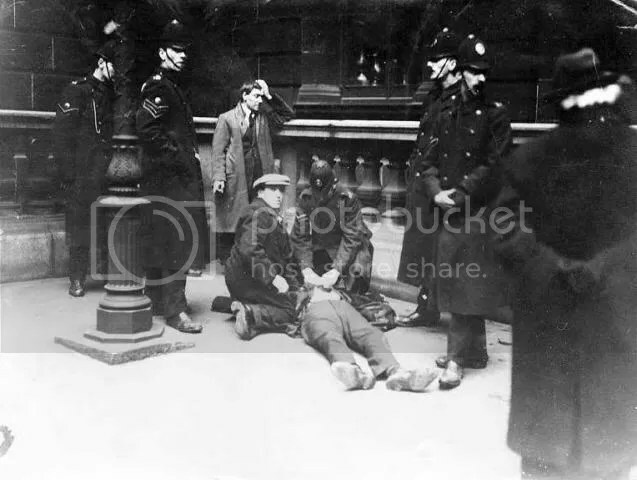 The fighting between the police and protestors spread to other parts of the city and throughout the day and well into the evening many men women and children suffered injury from the police. There were many arrests and Duke Street Prison was filled to capacity. Many strikers were later tried at the High Court in Edinburgh and sentenced to varying jail terms. 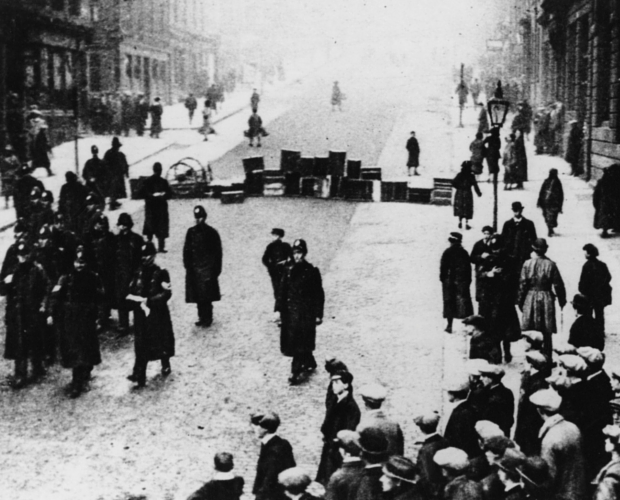 An uneasy calm returned to Glasgow, over the weekend but the intervention of the “Scottish Secretary” who described the rioting as a “Bolshevist Uprising” proved to be the catalyst for deploying the armed forces to the streets of Glasgow. The Coalition government (led by David Lloyd George) over-reacted, sending 10,000 English soldiers (heavily armed with heavy machine guns, howitzers and Tanks) to Glasgow. The “Battle Group” (the largest deployment of English soldiers on Scottish soil since the Battle of Culloden) arrived on Friday 7 February 1919. Martial Law was imposed on Glasgow and this was strictly enforced on the public by the English soldiers who speedily took control of the City Centre positioning heavy machine guns on the top of the Post Office building and The North British Hotel. A large howitzer was placed at the entrance to the City Chambers. City-wide English soldiers were deployed in force patrolling the streets, completing stop and search and ID checks on Glaswegians and guarding the docks, power stations and other key installations. An eyewitness said ‘the whole city bristled with tanks and machine guns’. The force was withdrawn from Glasgow on 16 February 1919 and located, for a time in barracks elsewhere in Scotland. The government fearing that Scottish soldiers might not obey orders to take action against their countrymen issued orders that they would be confined to barracks for the duration of the deployment of the English force to Glasgow. 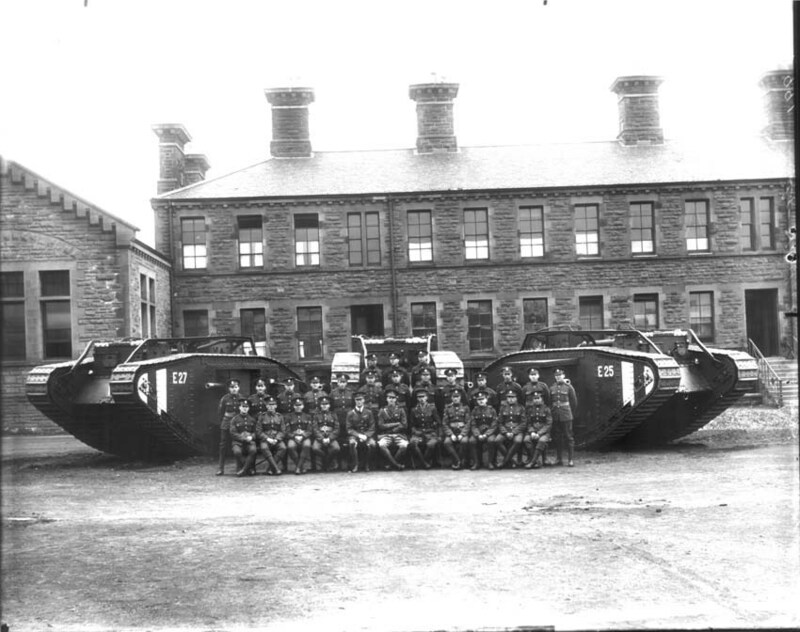 The Highland Light Infantry (almost exclusively Glaswegian) were disarmed and detained in Maryhill Barracks. Manny Shinwell, William Gallacher and David Kirkwood were jailed for several months. The striking workers returned to work with the guarantee of a 47-hour week, ten hours less than they were working beforehand. Three years later, in the 1922 GE, Scotland elected 29 Labour MPs, (including the 40 Hour Strike organizers and Independent Labour Party members Manny Shinwell and David Kirkwood.). The epithet of Red Clydeside was established. 100 years later – Are there parallels to be drawn? Scottish society has changed little in the last 100 years. Much of the poverty that existed at the time of the riot is still present today. Unionist governments in Westminster have taken Scotland’s young men to war in Iraq, Afghanistan, Libya, Syria, Serbia and other countries, without justification, spending obscene amounts of money whilst imposing massive cuts in key services such as education, welfare, infrastructure, and the NHS. Social housing building in Scotland was stagnant under successive Unionist Tory & Labour) governments and this has placed many families, (struggling to cope) at the mercy of greedy landlords who raise rents without justification. In Glasgow at 2019 there are many hundreds of newly refurbished flats lying empty, the cost of purchase being well beyond that of the typical Glaswegian. A situation that forces many families onto the streets. Where is the affordable housing promised by the Tories and Labour governments? The banking crash of 2007/8 brought with it many job redundancies and house repossessions as the resultant depression impacted on the economy. Yet not one UK banker went to jail for participating in the biggest banking frauds in history. Instead they were rewarded for their efforts,being allowed to operate much as before including awarding themselves and their fraudulent colleagues with undeserved massive multi-million pound bonuses whilst many thousands of Scots were thrown of society’s scrapheap never to work again. Ten years later the Unionist government in Westminster is still intent on asset stripping the poor using as excuse the “Austerity Plan” put in place by the Tory Party. A plan which took on a debt from Labour of around £800 billion and increased it to nearly £2 Trillion and rising. Iceland meantime jailed the bankers, imposed massive restrictions and returned their economy to balance within 5 years. 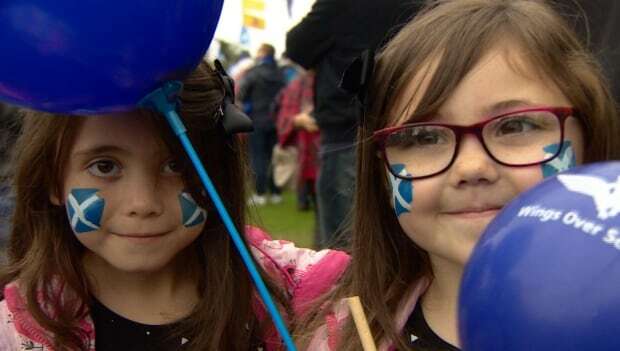 Author caltonjockPosted on November 20, 2016 January 21, 2019 Categories Uncategorized13 Comments on 1919 – Westminster Removed Their Weapons and Locked-Down Scottish Soldiers in Their Barracks – Then Illegally Deployed An English Battle Group and Declared Martial Law Against the Scottish Public. What Will a No Deal Brexit Bring?